So there are some things that I think the [Michigan Municipal League] and I are going to agree on. For instance, that unfunded liabilities for pension benefits and retiree health care are a huge cost driver for local governments. But we are not here to talk about the things we agree on but instead the things that we disagree on. So I am going to talk about our remarkably robust municipal finance system, while I assume that Anthony [Minghine] is going to talk about the broken municipal finance system. In building the case for my opinion, I’ll emphasize one point most of all: From 2000 to 2007, Michigan went through a one-state recession. Michigan was down one out of every 11 jobs. Then the rest of the nation joined us for the prolonged Great Recession. At the worst of it, Michigan had just one-third of the auto jobs that existed in 2000. Of course, not everything else in Michigan was as bad as that. 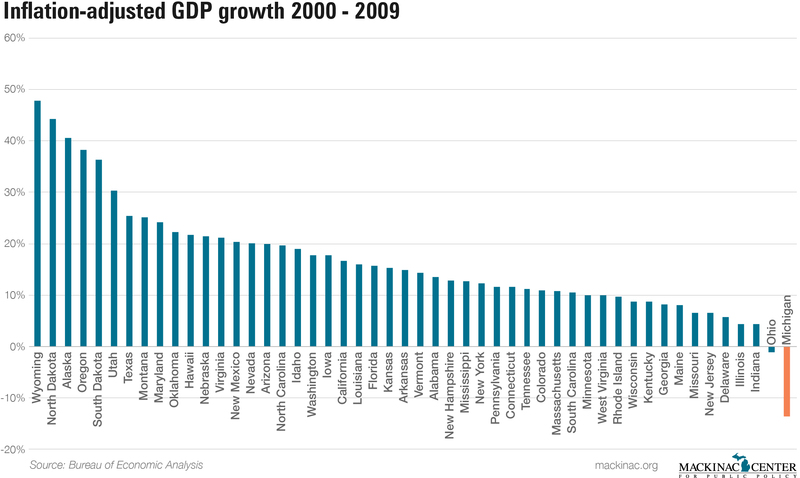 Michigan didn’t lose two-thirds of its GDP. Nominal GDP was flat from 2000 to 2009, real GDP was down 13 percent, by far the worst in the country. This meant major changes to government as well. State revenue was down 2 percent from 2000 to 2009. Now, that has to be taken with a grain of salt since lawmakers did a lot of spending outside of the budget. They ramped up refundable tax credit programs over that period, for instance, which lowers the total revenue available to spend in the budget. 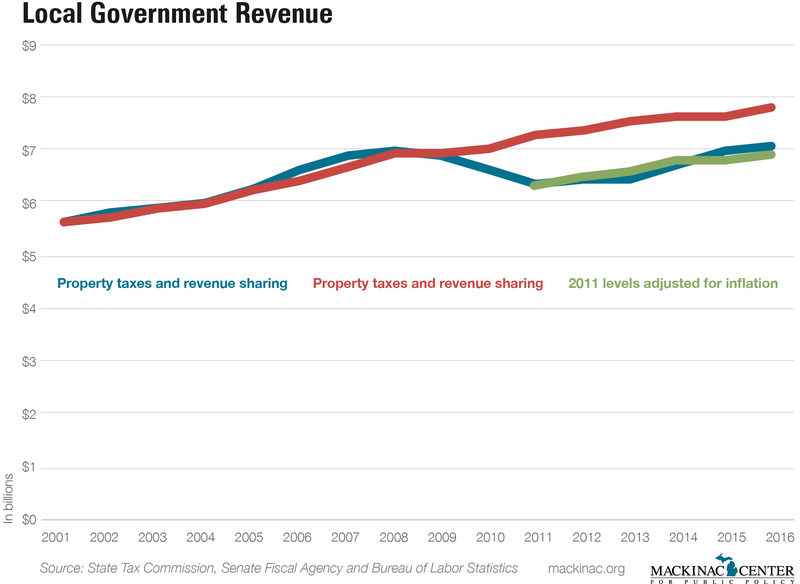 Yet even with that, property tax revenue — the largest source of revenue for local governments — increased. While everything else was going down in Michigan, the state was still participating in the housing boom. That was in a much more muted way, but still an increase. 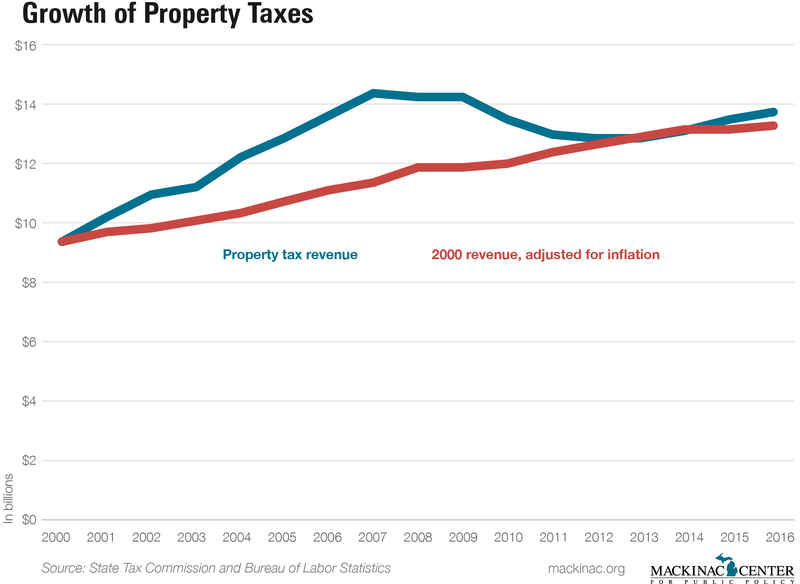 Property tax revenues increased from $9.5 billion in 2001 to $14.1 billion in 2009, a 49 percent increase at a time when few other things were growing as much. Local governments only get a share of that, of course, but it’s a share of a growing pie. So it’s not surprising that the discretionary payments that the state makes to local governments is down. The state’s total revenue sharing payments to local governments declined from $1.6 billion to $1 billion over the period. Note that the decline is far less than the $1.9 billion increase in city, village, township and county property tax growth over that period. It was the same for the money that the state gives to state universities. The state was struggling and schools were not. The schools would be fine with fewer dollars — they’d just have to have to raise tuition more than otherwise. Hence, real cuts to state universities. Now things are different. Michigan is rebounding. It’s attracting people back to the labor force. Wages, personal income and production are all up. That’s meant more money in the state budget and more money going to local governments. Revenue sharing increased from $1 billion to $1.2 billion. State payments to local governments went beyond that. As part of the personal property tax package approved by voters in 2013, local governments are being reimbursed for the money they lose out on new exemptions. But the amounts approved in the bills over-reimburse governments, this year to the tune of $135 million. Plus, there’s been more money for local roads and road commissions. The 2015 road package ramps that up another $700 million over time. There is one lagging piece in the recovery: construction. Housing construction fell from roughly 4,500 units per month in 2004 to around 1,000 units per month from 2009 to 2012. And it’s been a slow recovery. We’re around 2,000 now and there is upward trend. This is very important for local governments. New construction is exempt from Headlee calculations, which automatically lowers property tax mill rates when property values grow without approval of an overriding vote. The exemption of new construction is one of the reasons why local property taxes increased faster than inflation. And it’s the reason that total property taxes are not back to their peaks. They are up from their troughs, though even with newer property tax exemptions. And perhaps this growth will continue. So with these two general purpose spending sources — the larger property tax sources and the smaller revenue sharing — here’s what’s happened over the past 16 years. It’s kept up with inflation at a time when few things did before the recession, even as the state cut revenue sharing. During the Great Recession, there was a reduction in local government revenue of 6 percent. Since then, it’s increased above the inflation rate. Here’s my takeaway about our revenue system. It’s been remarkably robust through a historic change in the state economy. And it’s rebounding. It’s unreasonable to expect that the taxpayer financing of our local governments should continue to increase regardless of the state of the taxpayers that support them. And during a time when there have been profound economic changes, our local governments have been remarkably protected. I wanted to comment on a couple of the proposed policy changes. In the past, and I presume today, our friends at the Michigan Municipal League have recommended two things: give more state taxpayer money to local government and loosen constitutional restrictions. As to revenue sharing, we are giving more of it in addition to other assistance. But let’s talk about this further. If our friends at the MML are interested in making the case for more, they ought to say how much, what residents will get out of it, and where it will come from. There aren’t too many options for where it will come from — either from ongoing growth, from somewhere in the budget specifically, or from a specific increase in taxes. I would also question some of the necessity. There are some important declines in government service cost drivers. Violent and property crime is down 30 percent from 2007 to 2015, according to data from the state police. In 2006, local agencies reported 35,000 fires. That was down to 22,000 fires in 2016. Those are impressive improvements in public safety, and ought to provide some very positive fiscal effects on local governments. The next recommendation that has been made is a request to loosen constitutional taxpayer protections from the 1978 Headlee Amendment and the 1994 Proposal A. There are two limitations on local government provided by the Headlee Amendment: when a community’s tax base is broadened through property value growth above inflation, tax millage rates get automatically rolled back. This prevented what was considered unfair and unpopular increases in the burden of government. But even this limitation still allows for above-inflation growth since new construction is exempt. Officials can also call for voters to approve overriding the automatic rollbacks. The other limitation is to require new millages to be voted upon. But both ensure that local tax policy carries direct popular support. And you should want your residents to directly support your tax policies. If you don’t, then we have to have a much different discussion about democracy in municipal government. Proposal A prevents individual property assessments from increasing faster than inflation. This protects people on fixed incomes from being taxed out of their homes if their neighborhood takes off. But it also provides some general tax protections to individual homeowners that I imagine are both popular and preferred. While we hope that our homes increase in value over time, it’s rarely something that is in our direct control and people probably don’t want to be penalized much for it. I think there are some ways that we can ensure that local governments have the resources to provide important services to residents. But I think the revenue side of the equation has been remarkably robust, while there are glaring improvements that need to be made on the spending side.